Out of the 1.3 million lives that are lost due to traffic crashes worldwide, more than 10 percent (140,000 thousand) are in India, despite the fact that the country only has 2 percent of the world’s motor vehicles. Furthermore, urban areas in India account for 20 percent of the country’s total road traffic fatalities, and the majority of those fatalities are pedestrians and cyclists. Initiatives like Raahgiri Day and car-free days are helping to bring safety to the streets of cities across India. The street closures encourage people to walk, cycle, exercise, and reclaim their streets for safer roads, cleaner air, increased physical activity and community building. Sarika Panda Bhatt, a leader in the Raahgiri Day movement, was officially recognized by the government of the state of Haryana for her outstanding contribution in promoting sustainable urban transport and road safety in the state. 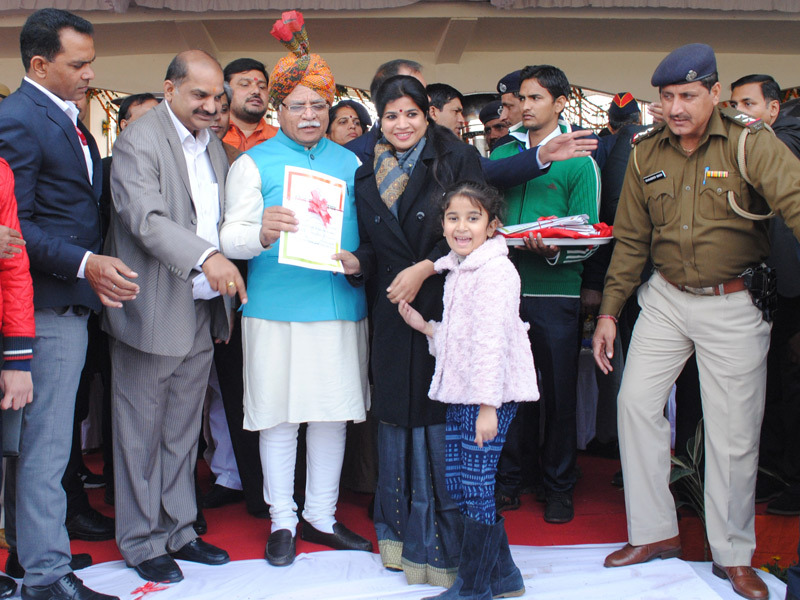 The Chief Minister of Haryana, Mahohar Lal Khattar, presented the Certificate of Merit to Sarika as part of the official state ceremony, which was organized in Gurgaon to celebrate India’s 67th Republic Day. The award demonstrates a growing recognition among local governments of the need for sustainable mobility options in India’s cities. Thanks to Sarika’s works, public authorities are beginning to shift their perspective on congestion. They have begun to acknowledge the rights of cyclists and pedestrians—a significant development for sustainable mobility in India over the past couple years. Sarika has been a leader in our Streets for All work and the recent award is a recognition of her active work with the State Police on the Raahgiri and car-free day campaigns as well as her dedication to safe street designs. For the past four years, Sarika has been consistently working with the Gurgaon police and the Haryana government. Her various projects have focused on improving road safety and promoting active transport in Gurgaon—known as the millennium city of India. Sarika was one of the founding members of Raahgiri Day and car-free day, the two sustainable transport initiatives that have put Gurgaon on the global map for safe streets. These initiatives continue to be replicated in several other cities. Additionally, Sarika helped the Gurgaon police organize a road safety summer camp for hundreds of school children last year. She is part of Gurgaon police’s Society for Safe Gurgaon (SSG) and, as the only female member, is focusing on issues related to women’s safety. The SSG consists of local residents who voluntarily assist the city police with information on local issues like road safety and congestion. As an urban planner, she has conducted road audits on several roads in Gurgaon, She has also developed a plan for model street design for a busy street in Gurgaon that connects a national highway with Huda City Centre metro station, the terminal metro station of the city. Recently, Sarika been working with Karnal, another city in Haryana, on a “smart cities” proposal. In Karnal, she has helped launch a car-free da, Raahgiri Day and other initiatives. Going forward, Sarika will continue to promote these initiatives in Haryana and other cities across India. She recently visited Rewari and Rohtak, two cities in Haryana, to evaluate the feasibility of car-free day events in these cities. The goal is to ensure the necessary infrastructure to meet resident’s basic mobility needs in Delhi and beyond.